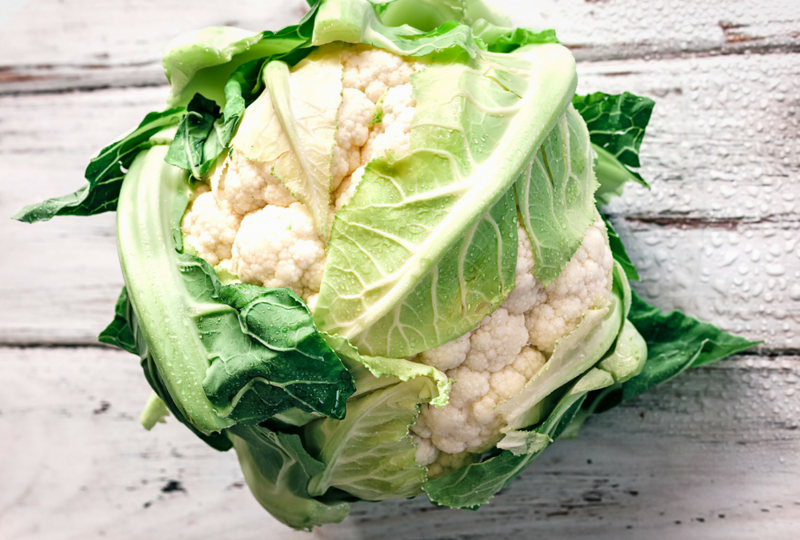 Cauliflower is a vegetable we are very comfortable with, it’s like an old friend, it’s always there and you never have to wonder why it’s in your life. I know I have been preparing it for family dinners for as long as I have been old enough to cook, but I am tired of the same old cauliflower recipes. My kids are the main reason I have been making cauliflower the same way over and over. However, there has been a really nice shift happening at my dinner table finally they are willing to try new things! They are now what you refer to as “tweenies” not quite kids, not quite teenagers. So, they are being a little more experimental with food without the fuss. I cannot tell you what a nice change this has been. I have a new pep in my step and I am experimenting with new recipes that I will of course share with you. Turmeric is a spice native to Southeast Asia and it’s a cousin to ginger. The ground yellow spice that we buy is made of the ground roots of the plant. This yellow spice has been used by many cultures as a wonderful natural dye. As a side note, when cooking with it be VERY careful, it will stain everything it touches, I have stained my kitchen bench, my hands, tea towels and pretty much anything I am wearing at the time! But it’s worth the mess, plus I’m the messiest cook going around so I know deep down it’s my own fault. Interesting little fact turmeric itself isn’t the star of the show, it has a component within it called curcumin, curcumin is the real star. It has powerful antioxidant and anti-inflammatory properties with revolutionary healing potential. Pre heat oven to 220c (fan forced oven). Line a baking tray with grease proof paper. Trim off the outer cauliflower leaves. Cut away the base of the stalk so the cauliflower can sit nice and flat. Rinse cauliflower and pat dry. Place cauliflower onto your prepared baking tray. Mix, the turmeric and garlic with the melted coconut oil, use a basting brush to apply the mixture to the cauliflower. Ensure the entire cauliflower is evenly covered with the mixture, including the bottom. The mixture will begin to solidify once on the cauliflower (see note), keep applying until all you have used all the mixture. Season with salt and pepper. 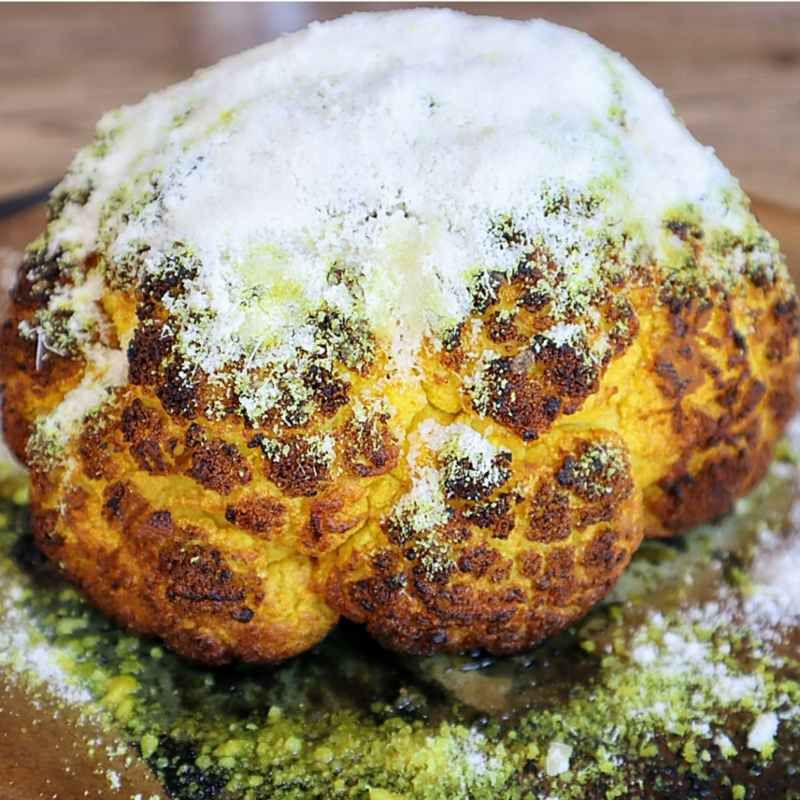 Bake the cauliflower for 45mins. Remove from the oven and place the cheese evenly over the cauliflower, gently press the cheese down with the back of a spoon to help it stick. Reduce the oven temperature to 200c and bake the cauliflower for a further 15mins. You will need to melt your own coconut oil for this recipe, because it will resolidify prior to baking and this helps keep it from sliding off when cooking. If you purchase liquid coconut oil, the mixture won’t stick as well.